Kumquats are the size of large olives. Photo courtesy White Flower Farm. How can it be that we’ve never published a piece about the kumquat? Today’s tip remedies that oversight. Native to China and now grown throughout Southeast Asia (plus the U.S. and elsewhere), the kumquat is a tiny citrus fruit that is entirely edible, skin and all. The orange flesh is juicy, acidic and tart (some varieties have are more tart than others). The skin is fragrant and sweet. Kumquats grow on small trees or bushes. They looking like wee, oval oranges, the size and shape of a large olive. The word “kumquat” comes from the Cantonese kin kü, meaning golden orange. The earliest historical reference appears in China in the 12th century. The tiny fruits were introduced to Europe in 1846 by Robert Fortune, a collector for the London Horticultural Society. Not long after, they arrived in North America, and found a happy growing ground in Florida. Here are dozens of kumquat recipes from Kumquat Growers of Florida—from kumquat ice cream to kumquat tea to kumquat cranberry relish. A final idea: halved kumquats, topped with cream cheese and pepper jelly, as an hors d’oeuvre or tea time snack. Look for firm, blemish-free fruit with a fresh scent. 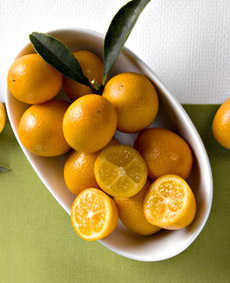 Avoid kumquats with green skins—they aren’t ripe and won’t ripen off the vine. You can refrigerate kumquats whole for up to one month, in a plastic storage bag. Freezing is not recommended. 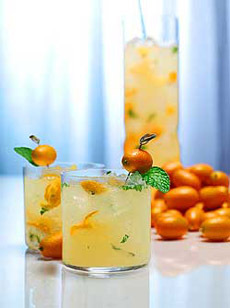 Use kumquats in cocktails or as a garnish. Photo courtesy Limonce Limoncello.